It might not actually be Ice Cream Tuesday today, but I have been selfish long enough, sitting alone and eating this no churn Junior Mint chocolate ice cream all by myself. No more! I disciplined myself to put down the spoon and pick up the camera, and now I’m ready to share with you! I used to love going to the movies when I was younger. I’d go with a boyfriend or, most frequently, Nadine and I would go together. 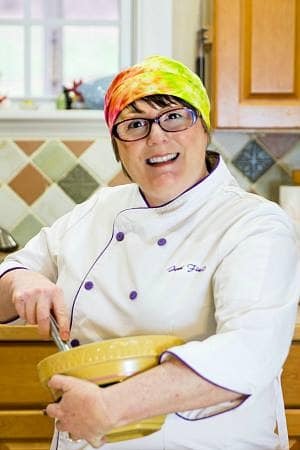 We’d sneak in Delicious Treats–one time we were able to smuggle in an entire loaf of Parmesan bread–or sometimes we’d just stand at the counter and order our favorite snacks. For me, that was often either a box of Milk Duds or a box of Junior Mints. And popcorn. And an Icee. The red flavor. A few weeks ago, I made Andes Mint Chocolate Chip No-Churn Ice Cream, and I have to say, that was pretty excellent. But this no churn Junior Mint chocolate ice cream has stolen my heart. So much so that, instead of posting a couple of weeks ago when I made it, I deferred taking photos more than three times in favor of eating a bowl of it. I almost finished the whole container in a couple of weeks. And I didn’t even share that much with The Beloved. Look at the decimated container, and this is after I put back the scoop that I photographed for this post! The good news is that I can now definitively say that no-churn ice cream base is superior to traditionally churned ice cream base in that, no matter how many times it softens and refreezes, it resists crystallizing. 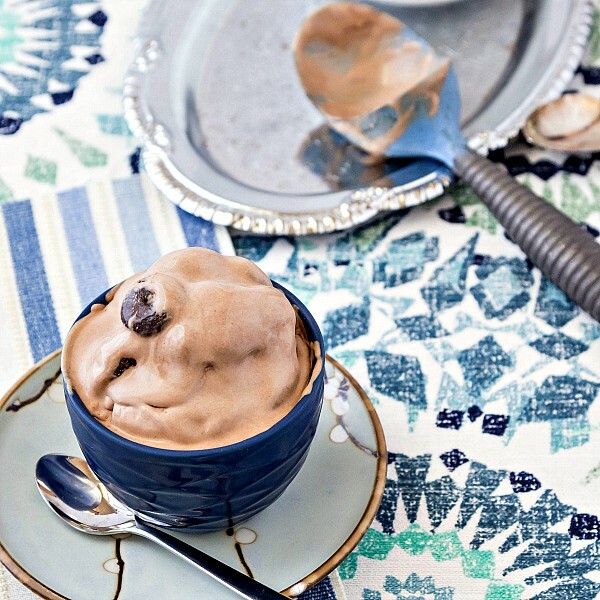 This ice cream is as smooth and creamy and perfect now as it was when I made it two weeks ago. If you haven’t jumped on the no churn ice cream band wagon yet, maybe that little fact will change your mind. Seriously, you guys. It’s pretty magical stuff! Enough talking. Let’s do this. Let’s make some ice cream, shall we? The ice cream had been sitting out for about 10 minutes by the time I took the photos. I freeze in metal containers, but as quickly as they allow ice cream bases to freeze, since they’re so conductive, they allow ice cream to melt just as quickly. 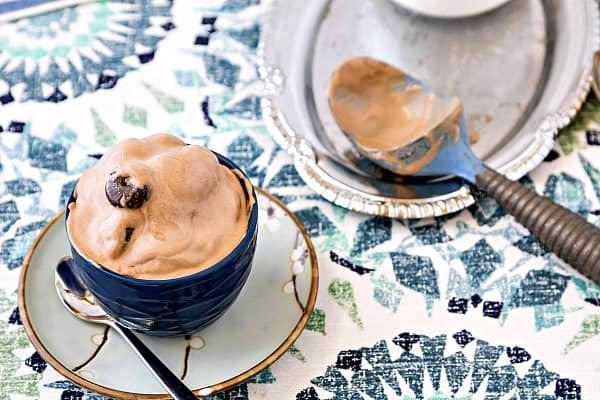 This no churn Junior Mint chocolate ice cream scoops like a dream straight from the freezer and acts like regular ice cream. I promise. Don’t be like me: buy yourself a bit more scooping time by storing your ice cream in an insulated container. 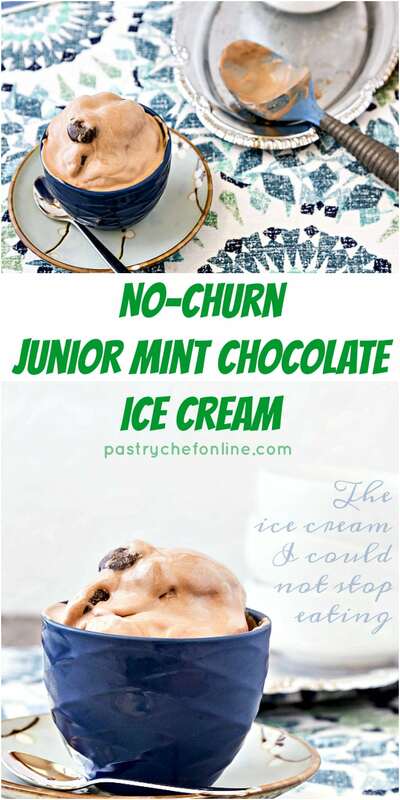 No Churn Junior Mint Chocolate Ice Cream checks a lot of boxes: chocolate lovers, mint lovers and movie candy lovers! This might just become your new favorite no churn ice cream recipe. It is definitely mine. several drops mint oil, , to taste (mint extract is less potent, and you can probably use about 1/2 teaspoon of the extract. Still: use to taste) Try to get the "mintiness" at about the same level as the candy, otherwise the chocolate base won't seem minty once you bite into a candy. In a saucepan, whisk the cocoa powder into the heavy cream and heat until hot but not steaming, about 140F. Remove from the heat, cool, cover and chill until cold. Chop the chocolate into small pieces (or use bittersweet chips) and place into a bowl. Heat the cream until it just comes to a boil. Pour over the chocolate and allow to sit for a minute. Whisk until all the chocolate is smoothly incorporated into the cream. Cool, cover and chill until cold. Place all ingredients except for the candy into the bowl of your stand mixer fitted with the whisk attachment. Whip on medium speed until the cream just starts to thicken a bit and then increase speed to high. Whip until the whisk leaves tracks in the cream and it is about the consistency of cake batter. It will mound slightly before smoothing out. Don't whip it until you get any kind of peaks. Fold as much of the Junior Mints into the base as you want. I went with almost the whole box which, while delicious might have been a bit excessive. Spread your ice cream base in a freezer-safe container, press plastic wrap onto the surface of the ice cream, and freeze until firm enough to scoop, at least six hours or overnight. Enjoy at your leisure. And I won't judge you if you don't want to share. You can whisk the cocoa powder into the cream without heating it, but you will still need to let it hang out in the fridge overnight if you want the base to be super creamy. 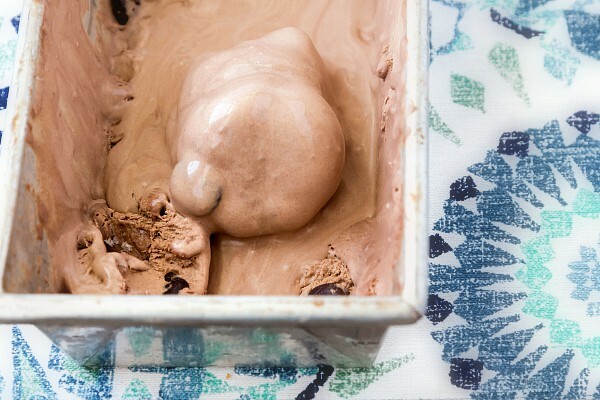 Making the ice cream with cocoa powder right away will give you good flavor, but there will be a hint of chalkiness to your ice cream for the first few days. Give the cocoa a chance to "bloom" by whisking it with hot cream and then chilling so your ice cream will be creamy right from the start. 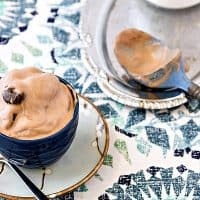 If you use bittersweet chocolate, your ice cream will set up a bit more firmly than the cocoa powder kind. Both kinds will be delicious (I've made both), so it's up to you! And there you have it. Smooth and creamy, guaranteed not to get all crystally and weird (for at least two weeks–and counting-but-not-for-much-longer)! 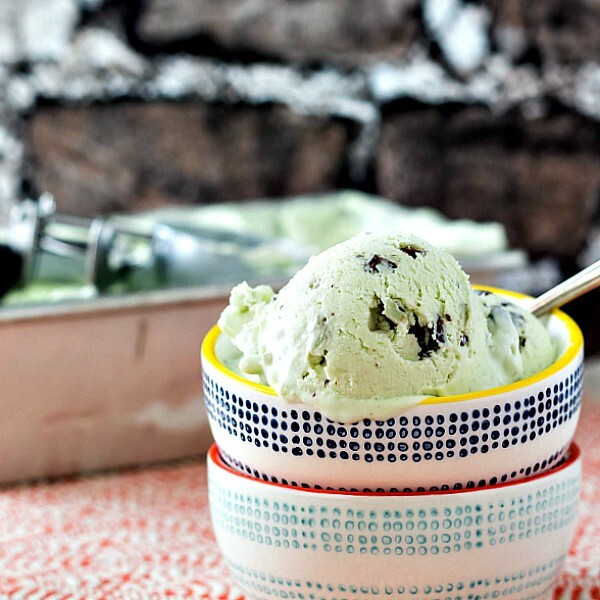 You are seriously going to love this no churn Junior Mint chocolate ice cream. Make some for your chocolate-loving, mint-loving, movie-candy-loving friends. Or make it for yourself. I won’t judge you if you decide not to share. Thanks so much for spending some time with me today. Take care, enjoy the ice cream, and have a lovely day. Now what would you like to do? 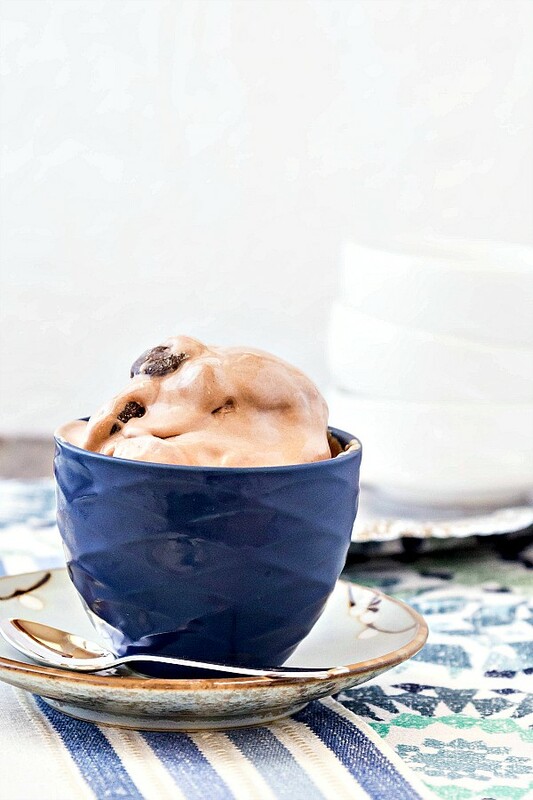 Click NEXT to explore my other Ice Cream Recipes.